A sales agreement suitable for any second hand road vehicle including a car, a motorbike, a van, a lorry or a truck. It has been drawn with private sales in mind. The agreement protects the seller against claims by the buyer at a later date that he was not informed about the state of the vehicle at the time of purchase. When you sell a second hand car, motorbike or other vehicle through private sales, it is critical that you agree the terms of the sale and purchase with the buyer in writing. Documenting the agreement and the state of the used car prevents the buyer from later claiming that you misled him as to the condition and demanding his money back. If you are the buyer, then a car sale agreement gives you peace of mind that you know what you are buying. In any private sale, you can agree the terms between yourself and the other party. As a seller, you could advertise your car with a poster in the window with “sold as seen, no warranty given or implied” written on it and accept cash in hand from the first person who wants to buy. The agreement would be verbal and legally binding. The problem with this sort of arrangement is that there is no record of what was agreed. If the buyer came back (perhaps with a genuine complaint) six months later, either party could argue that important information was withheld at sale (or not) and demand money back. There are many free versions available on the internet but in our opinion, free versions don’t go far enough to document the car or the legal agreement. The Net Lawman version, while not free, is far more comprehensive and thus protects both parties far more greatly. Also suitable for other road vehicles, including motorbikes, vans, lorries and trucks. 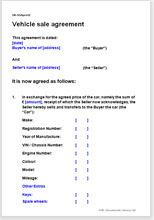 To use this car sales agreement, complete as many details in advance as possible (the template is in Word format) and then print two copies, one for you and one for the other party. Complete the remainder of the form in front of the other party. Both parties should sign both copies and keep them as proof of sale. "I hate any kind of legal documents so dreaded what lay ahead of me when I downloaded your document. However, what I found was a wonderfully easy and user-friendly document that could be very easily tailored to suit my needs...the notes were very easy to follow. I now have my privacy document. So my feedback: superb...so easy and user-friendly.